The forests of north-east India are well known for the rich biodiversity they support, both faunal and floral. These forests also support the highest diversity of primates in India, including the only apes found in the country, the western hoolock gibbon (Hoolock hoolock) and the eastern hoolock gibbon (Hoolock leuconedys). Often confused as one species, both the gibbons inhabit different ranges in India. 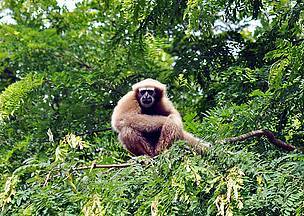 The western hoolock gibbon has a much wider range, as it is found in all the states of the north-east, restricted between the south of the Brahmaputra river and east of the Dibang river. Outside India, it is found in eastern Bangladesh and north-west Myanmar. The eastern hoolock gibbon inhabits specific pockets of Arunachal Pradesh and Assam in India, and southern China and north-east Myanmar. Of the two, the western hoolock is listed as Endangered in the IUCN Redlist, while the eastern hoolock is listed as Vulnerable, and both species’ populations have been declining due to habitat destruction of various forms and hunting for meat. With long and slender arms, hoolock gibbons are swift creatures, barely needing to step on the ground. They swing from tree to tree in a mode of locomotion known as Brachiation, and can brachiate at speeds upto 55 km/hr, covering upto six meters in just one swing! Very less study has been conducted on the behavior and habitat of the eastern hoolock, though they are considered similar to their cousins with variations in diet depending on their ranges. Their diet comprises mainly of fruits, but they sometimes also consume leaves, shoots and flowers. Males and females are of similar size, but can be differentiated easily by the coloration of their dense hair. Males are black with a distinctive white brow, while females are copper-tan with dark brown hair on the sides of their face, and a clear central parting in the head hair. They form monogamous pairs that remain together for years, though mating outside the pair has been noticed in some individuals. Hoolocks are famous for their emotive call that echoes across long distances in the forest, and is used by individuals to attract mates. Females give birth to one offspring every 2-3 years, and it remains within the family group for 7-10 years. Populations of western hoolock gibbons have declined by almost 90% over the last 30 years, and it is now considered to be one of the most endangered 25 primate species in the world. In India, it is listed on Schedule 1 of the Indian (Wildlife) Protection Act 1972. Enhancing protection for the species, the Government of Assam upgraded the status of the Hoollongapar Reserve Forest in the Jorhat District of Assam to a Gibbon Wildlife Sanctuary in 1997, making this the first Protected Area ever named after a primate species. WWF-India works in the state of Assam and Arunachal in north-east India with a holistic conservation approach towards protecting flagship species like tigers, rhinos, and elephants. The hoolock benefits indirectly from WWF-India’s conservation initiatives in its range. 3. Brockelman, W., Molur, S. & Geissmann, T. 2008. Hoolock hoolock. In: IUCN 2011. IUCN Red List of Threatened Species. Version 2011.2. www.iucnredlist.org. Downloaded on 21 May 2012.